HP Bright White Inkjet Paper with ColorPRO Technology delivers professional quality, striking results. See more striking colors, crisper text and graphics, and higher-contrast blacks. Meet the environmental objectives of your company and your clients with this recyclable, FSC®-certified paper. Optimize your everyday printing with the reliable, trouble-free performance of cost-effective HP Bright White Inkjet Paper. 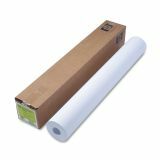 HP DesignJet Large Format Paper for Inkjet Prints, 4.7 mil, 36" x 300 ft, White - Inkjet bond paper is ideal for everyday, black and color line drawings. Specially treated matte surface consistently produces crisp line resolution and high-contrast color prints. Brilliant, high-contrast surface makes black and color lines and text appear sharper. 24 lb. bond paper is compatible with most HP Designjet printers. Core size for the roll is 2"". 5.94" x 5.94" x 37.69"